Commissioned into the Royal Navy, the only cruiser named after an inland county, this ship had been purchased through the savings of about 2.5 million Pounds from all corners of the county of Shropshire, after whom the ship drew her name. After HMAS Canberra had been sunk at the Battle of Savo Island on the 9th. of August 1942, the British Prime Minister, Winston Churchill made the decision to replace her by gifting HMS Shropshire to the Royal Australian Navy. 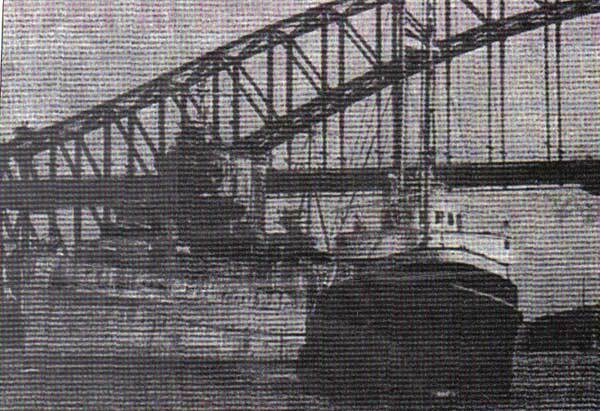 She became HMAS Shropshire, when after a refit at Chatham Dockyard, the RAN manned her in August of 1943. Many of Canberra's survivors went on to crew Shropshire, including myself. 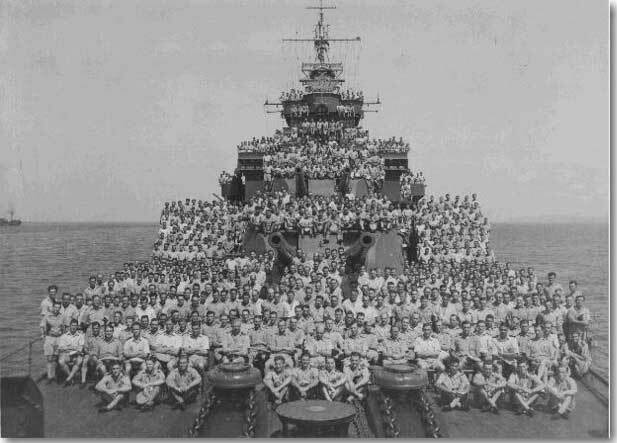 Shropshire and her crew in Lingayen Gulf, January 1945. King George VI visits Shropshire. The RAN's latest acquision sailed for Scapa Flow to be visited by His Majesty King George the VI. It had been planned to rename the ship Canberra, but President Franklin Roosevelt decreed that a new USN heavy cruiser would carry the name Canberra, the only US cruiser to ever bear the name of a foreign capital. Lady Dixon, the wife of Sir Owen Dixon, the then Australian Minister to Washington, launched and christened the new ship. Shropshire served with distinction in the Pacific. Shropshire with a call sign of Porthole, made a name for herself in the Pacific war, she fought all the way to Tokyo, and was known as both an efficient fighting unit that never lost a man to enemy action, and a happy, and lucky ship. She was the target for many Kamikaze attacks, destroying some 11, and being involved in the demise of another 8. At war's end, Shropshire was there in Tokyo Bay for that momentous moment, the signing by the Japanese delegates of the Instrument of Surrender, on board USS Missouri. 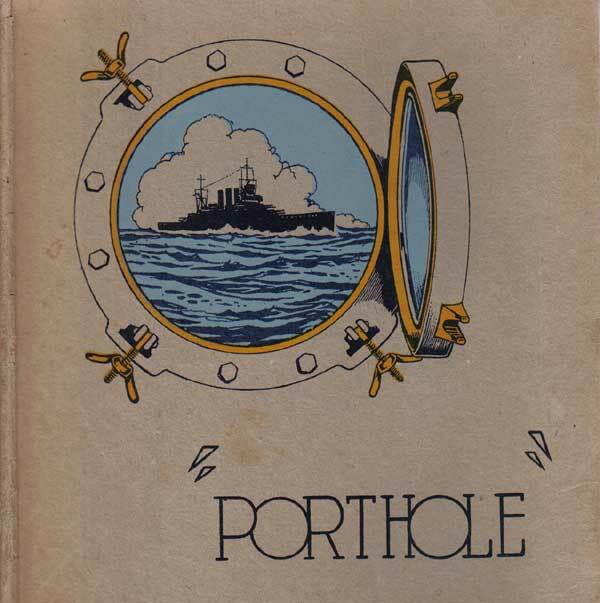 Porthole, the well known call sign of HMAS Shropshire used in the war in the Pacific. Decommissioning, and the last voyage to the breakers's yard. In 1947, Shropshire decommissioned, and come 1954, on the 9th. of October she hooked onto the end of an 8 inch steel wire rope, about a quarter of a mile long. On the other end, the powerful Dutch tug Oostzee, the long haul of 14,000 miles from Sydney to the Ship Breakers, Thomas Ward at Barrow- in Furness got underway. In the shadow of the famous Sydney Harbour Bridge ( a glimpse of which her crew craved for, when in action so many times in the Pacific war ) many of her old Sailors watched, as she was eased slowly out of Sydney Harbour, I am sure some tears wereshed that day, t'is a sad moment when a beloved ship is off to become razor blades. It took some skilful and prudent towing to drag the tired old cruiser north about Australia, via Aden, Suez to arrive off Gibraltar by the New Year of 1955. The Dutch Tug Company had sent off their Tug Goeree to rendezvous there with Oostzee and her charge for the dangerous transit of the Bay of Biscay. Gales persisted, and with a force 12 wind, and standing well clear of Barrow to ensure that Shropshire did not strand on a lee shore, the two tugs headed into the Firth of Clyde. In the quieter lee provided by the Scottish hills, the cruiser was led past Gourock, into the river she had slipped down when brand new, back in 1929. The long tow and sad last voyage of an heroic ship at last over, as she was secured to W. Arnott Young's breaking jetty at Dalmuir. Shropshire was within a few hundred yards of William Beardmore's slip, where she had been launched in 1928. HMAS Shropshire about to start her long tow to the Ship Breakers, by the Dutch Tug, Oostzee, leaving Sydney on the 9th. of October 1954 arriving in the Clyde Scotland, on the 20th. of January 1955. A sad sight for all her former crew members. Shropshire demolished by the wrecking gang. Swarms of the wrecking gang soon removed all the valuable material within the ship's hull, her remains towed down stream to Troon, and after beaching there, the blow torches nibbled away to turn the remains into smelter furnace feedstock so that new steel might emanate from this old carcass. HMS and HMAS Shropshire at last, ALL GONE! Tug Oostzee disappears in a Typhoon. J and K Smits, the Dutch owners of Oostzee sold her off to a Manila Towing Company in 1970, on her first assignment for her new owners, she disappeared without trace in a typhoon, some 200 miles south of Hong Kong. The tug, her tow, and all hands gone, for the records just MISSING.